Run more. Eat more chocolate. It is so easy to feel frustrated and slow when returning from injury. Regaining fitness is so much harder than losing it. You want to push yourself, but your body isn’t ready for it. Gains seem so incremental. It is so hard to focus on how far you’ve come, when all you can think about is how far away your PRs still seem. I’m now 14 weeks into my recovery, and it is still a mental struggle. I still feel so far from where I was last fall. I still have far more runs where I feel out of sorts than runs where I feel like everything clicks. But I’m going to put myself to the test on Saturday. I’m running the Oakley Mini 10K in Central Park. It’s a pretty big women-only race that actually draws some elite runners. Molly Huddle won last year, while Deena Kastor took first for the masters division. It is also a “team points” race for NYRR running teams, so it draws a lot of the more competitive local runners as well. My goal is to PR—preferably with a time of 43:30 or faster, which translates into a roughly 7:01 min/mile pace. My current PR is a 44:30, but here is the catch: that time is from December 2012. That means that time is from before I ran my first marathon. That time is from less than three months after just my second half – the Hamptons Half Marathon – and just six months after I really returned to running consistently. 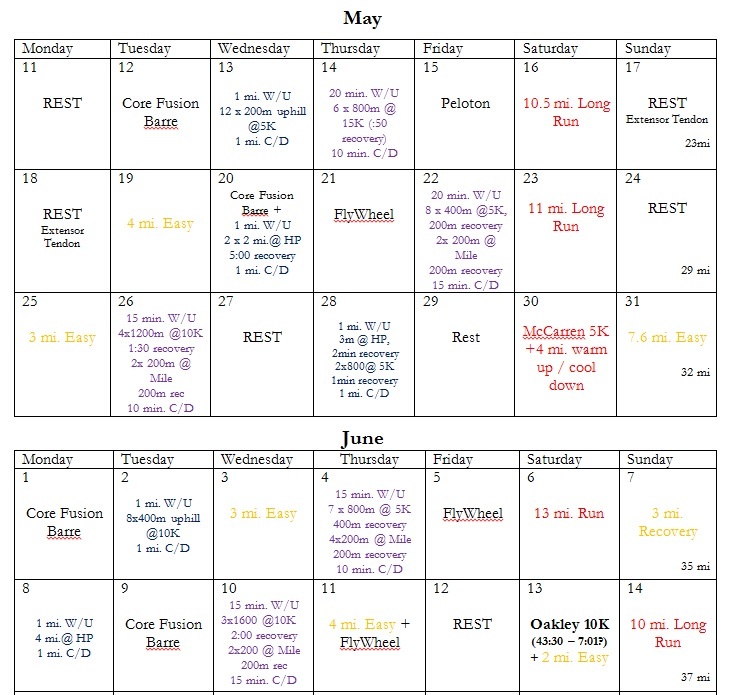 I really want to believe that even now, 14 weeks out from a stress fracture, I’m faster than I was back then. I weigh about the same as I did back then, but I’m so much healthier now. I eat better, I’m generally more active (not just with running, but throughout the work day as well). And I’m a more experienced runner – that has to count for something, right? Secret: I ran a local 5K two weeks ago in 21:10. That’s about 40 seconds off my 5K PR, but it suggests a new 10K PR might be in the cards tomorrow, if everything goes well. But 43:30 will probably be a stretch. But there is the catch: “if everything goes well.” My calves and quads have been tight and sore all week, and it is supposed to be really hot and humid at the start – about 78 degrees and 70% humidity. Ouch. I’ve done everything I could in the short amount of time I’ve really been back running though. Every week for the past five weeks, I’ve done one hill or tempo session and one track session, and I’ve built up decent mileage. Now, all I can do is trust in myself and hope for the best. (And not drink tonight.) Race report next week! Posted on June 12, 2015 July 21, 2015 by KaitlynPosted in TrainingTagged 10K, Injury Recovery, Running, Training.